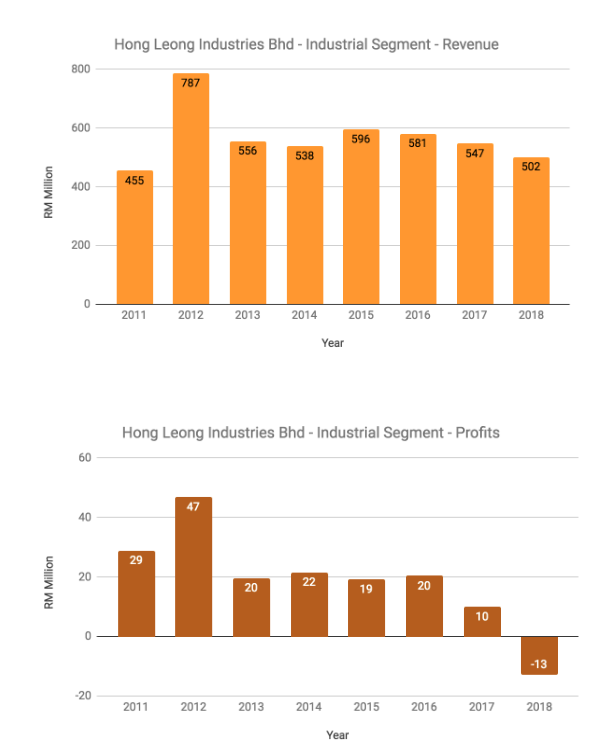 Is Hong Leong Industries Bhd Attractive To Investors Now? 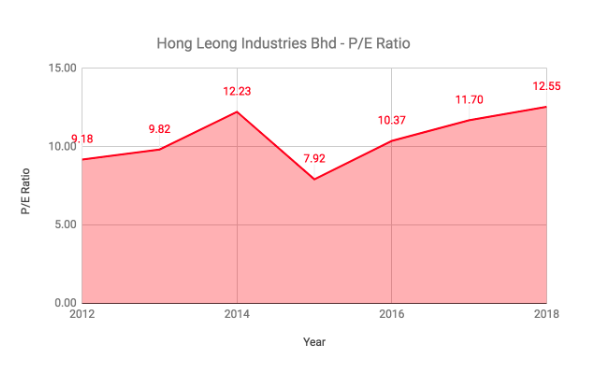 Finally, Hong Leong Industries Bhd (HLI) has dropped below RM 10.00 a share, after being traded above RM 10.00 levels throughout the entire year 2018. As shown below, HLI’s current stock price is 26.8% below RM 12.22, its peak that was recorded on 25 May 2018. Often, I am more enthusiastic to know a price fall in a good stock as compared to a price hike. This is because it may potentially be a good opportunity to buy and accumulate shares of good companies at bargain prices. Before doing so, it is wise to perform a due diligence to ensure the qualities of a stock in terms of its fundamentals have remained intact. Here, I would check its fundamentals and evaluate its investment potentials based on current stock price of RM 8.95 a share. Here are 9 key things to know about HLI before you invest. HLI derives income from manufacturing, assembly and sales of Yamaha motorcycles in Malaysia and Vietnam and manufacturing and sales of a wide range of ceramic and porcelain tiles in Malaysia under its Guocera brand presently. This segment is HLI’s largest income contributor. Sales had grown from RM 1.34 billion in 2011 to RM 1.99 billion in 2018. This led to increasing segmental profits from RM 178.1 million in 2011 to as high as RM 297.7 million in 2018. It derives income from manufacturing of fibre cement board under its brand name, ‘PRIMABOARD’ and concrete roofing tiles in Malaysia. In 2013, this segment has disposed Hume Industries Sdn Bhd and hence, causing a sharp drop in revenue from RM 787.5 million in 2012 to RM 555.9 million in 2013. It raised a little to RM 596.4 million in 2015 and subsequently, started to fall to RM 502.2 million in 2018. It had led to the segment’s first loss incurred in 2018. Overall, HLI has achieved steady growth in group revenue, up from RM 2.15 billion in 2012 to RM 2.49 billion in 2018. It is contributed from its consumer segment. 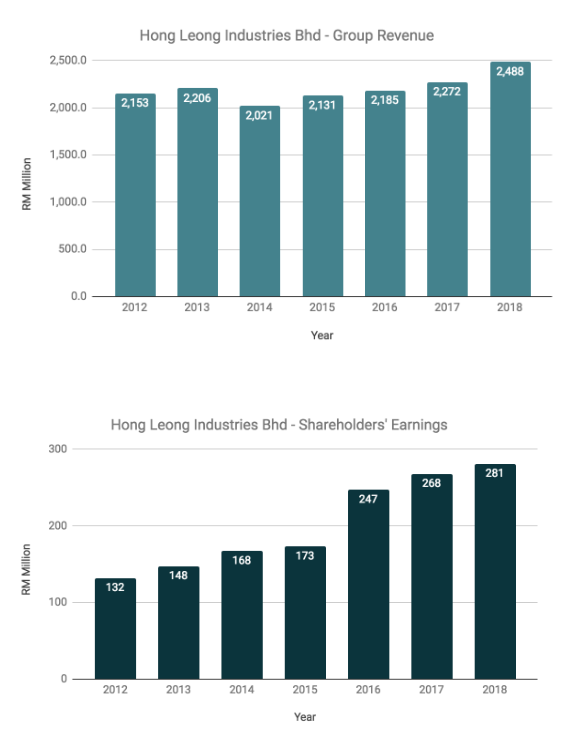 During the period, HLI has reported faster increase in shareholders’ earnings, growing from RM 132.0 million in 2012 to as high as RM 281.1 million in 2018. Its earnings figures for both 2016 and 2017 were adjusted to exclude one-off impact arising from the disposal of 30%-owned Malaysian Newsprint Industries Sdn Bhd. 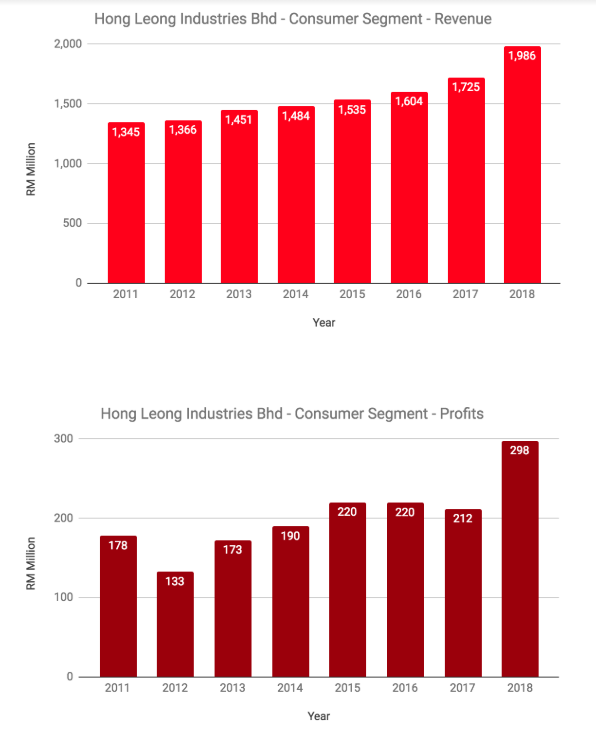 Its fast growth in earnings were contributed by a rapid profit growth achieved by HLI’s associate companies during the period. HLI has made 5-Year Return on Equity (ROE) average of 15.85% a year. 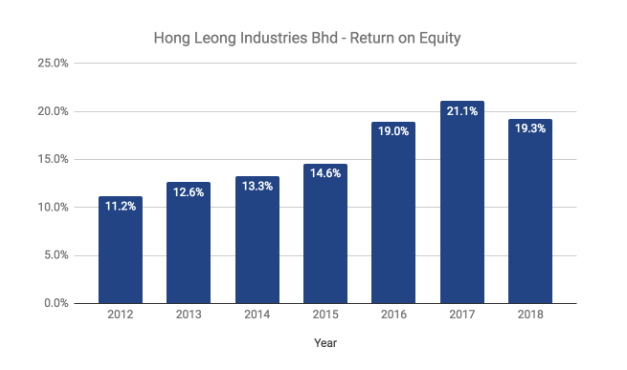 It means, HLI had made on average RM 15.85 in annual earnings from RM 100.00 in shareholders’ equity from 2012 to 2018. 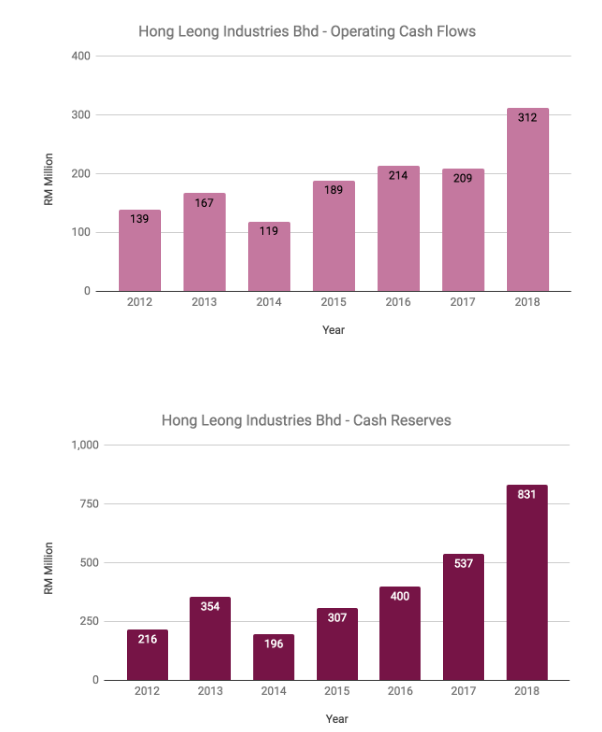 HLI has generated RM 1.35 billion in operating cash flows from 2012 to 2018. During the period, it has received RM 659.4 million in dividend & interest income. From which, HLI had spent RM 306.1 million in capital expenditures, paid off RM 362.4 million in net long-term debt, and paid out RM 717.8 million in dividends to reward its shareholders. Overall, it has grown its cash reserves from RM 215.6 million in 2012 to RM 831.3 million in 2018. As at 30 September 2018, HLI has non-current liabilities worth RM 37.1 million and shareholders’ equity of RM 1.53 billion. Thus, HLI’s gearing ratio is 2.42%. HLI has further increased its cash reserves to as much as RM 911.7 million. 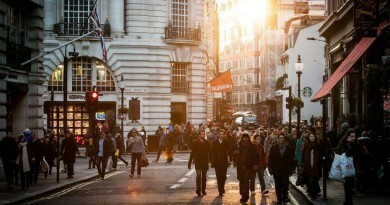 It has a current ratio of 3.74 and thus, indicating that HLI has maintained a solid balance sheet with flexibility to use its funds to expand its operations or continue to pay out dividends in the future. In 2018, HLI has reported earnings per share (EPS) of RM 0.905. Hence, its current P/E Ratio is 9.89. It is below its 7-Year Average of 10.54 and the lowest since 2016. As at 30 September 2018, HLI has recorded net assets per share of RM 4.89. Thus, its current P/B Ratio is 1.83. It is the lowest P/B Ratio since 2016. 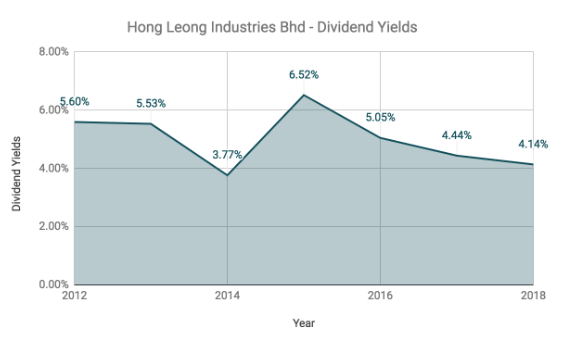 In 2018, HLI has paid out RM 0.37 in ordinary dividends per share (DPS) to its shareholders. Hence, its dividend yield is 4.13% per year, which is the highest since 2016. For the last 3 years, HLI has paid out an addition RM 0.10 in special DPS on top of its ordinary DPS. Thus, in 2018, HLI has paid out a total DPS of RM 0.47. Based on total DPS, its dividend yield is 5.25% per year, above its 7-Year Dividend Yield Average of 5.01%. Overall, HLI has delivered stable financial results to its shareholders from 2012 to 2018. This is contributed from its consumer segment. So, is this a good time to invest in HLI? Here, I would highlight both pros and cons for investing in HLI at current stock price of RM 8.95 a share? 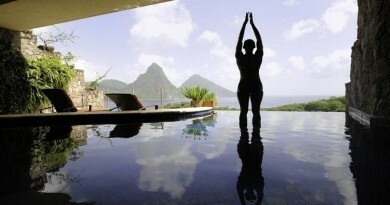 Track Record of Sales & Profit Growth from its Consumer Segment. Solid Balance Sheet with Low Debt-to-Equity Ratio of 2.42% and ample cash reserves of RM 911.7 million. P/E Ratio under 10.0 presently – a Rare Discovery of stocks with market capitalization above RM 2.5 billion. 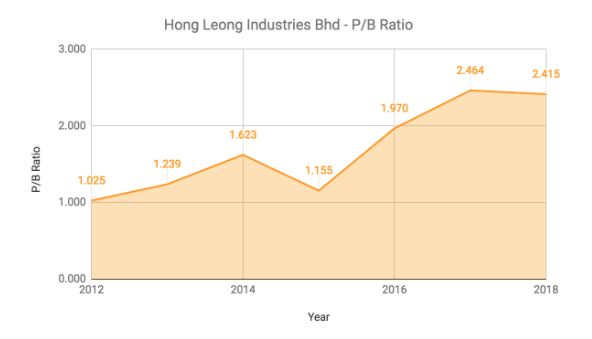 Lowest P/E Ratio and P/B Ratio since 2016.
Dividend Yields ranging 4.13% – 5.25% per annum. 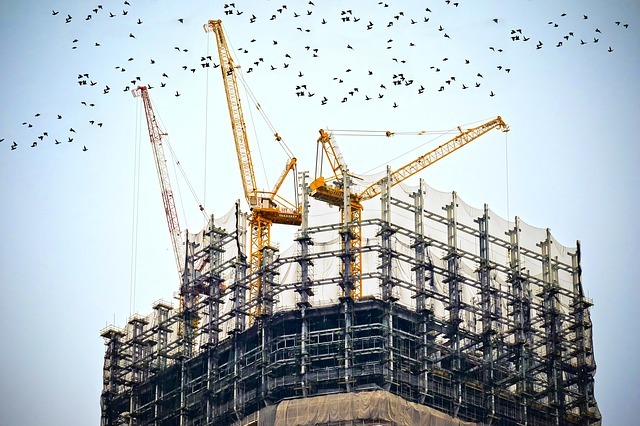 Industrial segment is dependent on the local construction sector which is facing challenging market condition. Little discussion given on its prospects for future growth. You call the shots. Happy Investing! ← Is Capitaland’s $11 Billion Acquisition of Ascendas-Singbridge a Good Deal? 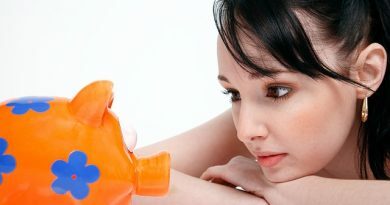 Is Hong Leong Bank Bhd Worth Investing In? Your analysis is identical with my studies. However, may i know if this is the kind of company that you would add to your portfolio?